Nails! How do I trim those? And what if it is broken?! We all have these lovely, keratin-based structures- but dog and cat nails are different from ours. Here are some of the top questions about pet nails we receive on a daily basis. How often should I trim my pet’s nails? With cats and dogs, trim their claws about once monthly. Depending on what they do in a day, some animals will wear their claws down more or less quickly, thus altering how often they need those claws trimmed. 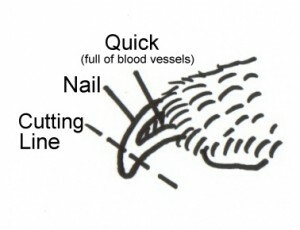 Of course, cut the white portion of the nails, don’t trim back into the blood vessel (otherwise known as ‘the quick’). There are ways to hold cats to help reduce their anxiety. For example, wrapping them in a towel, or using an appealing treat can help. If you are nervous about trimming your pet’s nails, we are more than happy to provide this service for you. If you would like to see how we perform this task, we can teach you as well. What happens if my pet breaks their nail? Our pet owners often notice a broken nail when their pet is licking at the nail, and/or if blood is on the floor, depending on the nail break severity. If the nail is bleeding excessively, perform first aid treatments to try to stop the bleeding. If you can wrap the foot with gauze or a towel, using slight pressure to stop the bleeding, this is preferable. 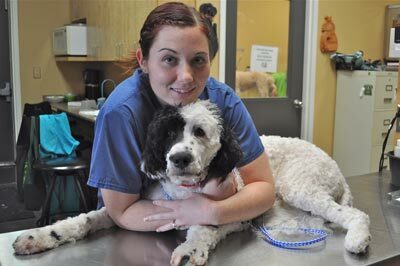 Bring your pet into a clinic as soon as you can for the area to be evaluated. Broken nails are painful, and the more the area is rubbed against the ground, the more likely the pain, inflammation, and bleeding is going to continue. So many owners attempt to treat a broken nail on their own, but the problem will magnify over time, leading to infection. What do we do? After giving pain medication, then numbing the area with local anesthetic, the nail is clipped off at the base. The bleeding is quickly stopped with styptic powder, then a bandage is applied with an antibiotic ointment. Our pets are sent home with pain medication as well as antibiotics to help prevent any infection from ascending into the adjacent bone to a bone infection. The majority of broken nails are just caused by a bad step or an area of weakened keratin. A few pets may have other underlying issues such as abnormal keratin formation in the nails, or a cancer in the nail which makes it more prone to breakage. These are just a few of the other issues which we evaluate when looking at the broken nail. As always, give us a call if you have any questions or want a nail trim on your pet!